PANGKALAN BUN, Indonesia -- A tail section from the AirAsia plane that crashed into the Java Sea late last month, killing all 162 people on board, became the first major wreckage lifted off the ocean floor Saturday, but the all-important black boxes were not found inside. 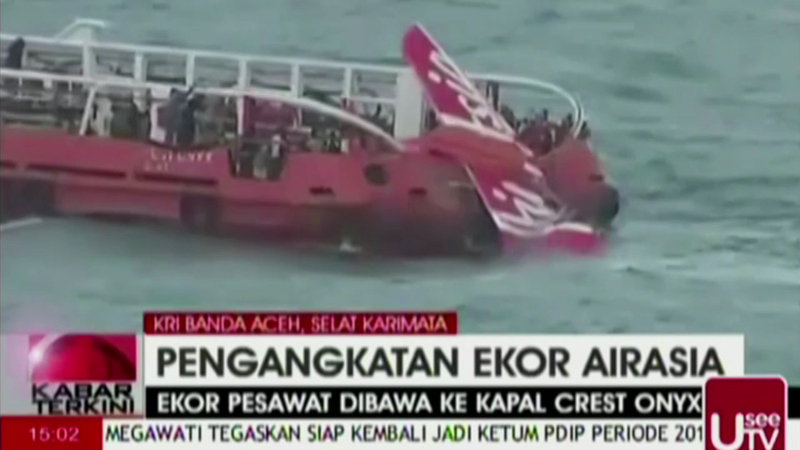 The red metal chunk, with the words "AirAsia" clearly visible across it, was brought to the surface using inflatable balloons. The cockpit voice and flight data recorders, located in the plane's rear, must have detached when the Airbus A320 plummeted into the waters Dec. 28, said Indonesian military commander Gen. Moeldoko. Their recovery is essential to finding out why Flight 8501 crashed. "I am fully confident that the black boxes are still not far from the tail," Moeldoko said. The tail's discovery earlier in the week was a major breakthrough in the slow-moving search, which has been hampered by seasonal rains, choppy seas and blinding silt from river runoff. But Suryadi Bambang Supriyadi, operation director of Indonesia's national search and rescue agency, said Saturday that he was still focused on finding the main section of fuselage, where most of the bodies are believed to be entombed. Several large objects have been spotted in the area by sonar, but they have not yet been explored underwater. So far, only 48 corpses have been recovered. "This is what the families have been waiting for," Supriyadi said. "They have been crying for 14 days." The last contact the pilots had with air traffic control, about halfway into their two-hour journey from Indonesia's second-largest city, Surabaya, to Singapore, indicated they were entering stormy weather. They asked to climb from 32,000 feet (9,753 meters) to 38,000 feet (11,582 meters) to avoid threatening clouds, but were denied permission because of heavy air traffic. Four minutes later, the plane dropped off the radar. No distress signal was issued.